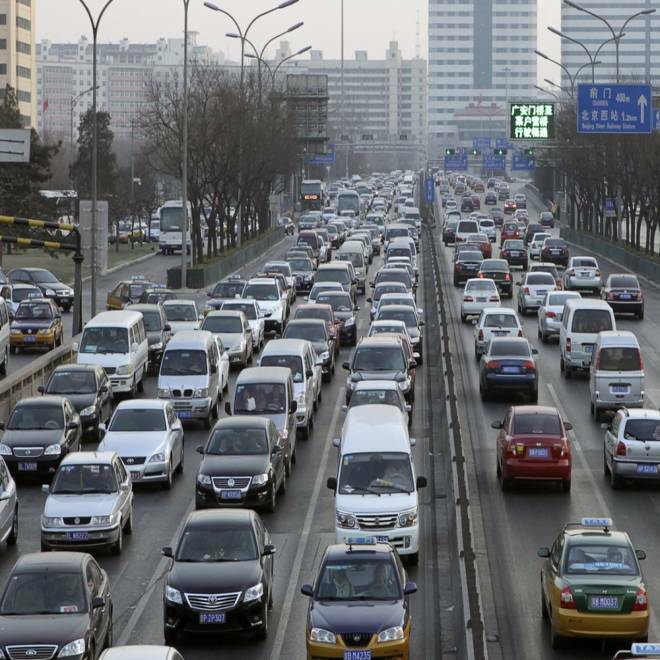 In this file photo, cars travel on a main road in a traffic jam at the second ring road in Beijing. Traffic blows. It's unhealthy and a waste of time. It is also a fact of life in almost every major city around the world, especially in fast-developing China where as many as 20 million rural farmers migrate to the cities each year looking for jobs and a better life. "Most taxicabs in Beijing have been embedded with a GPS sensor when they were built for the purpose of dispatching and management," Yu Zheng with Microsoft Research Asia in Beijing, explained to me in an email. The taxicabs also carry a sensor that lets dispatch know when a passenger is on board. The combined data paints a picture of where, when and how people travel around the city. Zheng and his colleagues gained access to this Big-Brother-like dataset for 30,000 taxicabs spanning the years 2009 and 2010 and analyzed it with computers. The results point out well-known flaws in urban planning such as busy business and entertainment districts with inadequate roads and subway lines as well as local knowledge including detours cabbies take to avoid known choke points at rush hour. "Essentially, GPS-equipped taxicabs can be viewed as ubiquitous sensors constantly probing a city's rhythm and pulse such as traffic flows on road surfaces and city-wide travel patterns of people," reads a paper Zheng presented at the 13th International Conference on Ubiquitous Computing earlier this month. The comparison of 2009 to 2010 data highlights where urban planning is working or not. For example, the data shows how a newly constructed road in one part of the city eased traffic congestion for people trying to access a highway. Despite the improvements, the number of regions experiencing traffic headaches increased and some of the snarls that were occurring in 2009 still exist, Zheng noted. The good news for Beijing dwellers is that urban planners are on top of some of these problems. An analysis of these plans shows, for example, that the construction of two new subway lines will solve a well-known traffic problem in the densely populated residential Wangjing area of the city. To date, the researchers have been able to identify where the traffic flaws are. In coming months, they plan to analyze the reason behind the flaws such as why people are traveling where and when they do. In the future, Zheng said, the team hopes to apply this approach to other cities. That could be good news to residents everywhere from Mexico City to Johannesburg and many points in between that show up in the 2011 iteration of IBM's Commuter Pain Index. Where do commuters hurt the most? When Sal Khan began posting free math lectures on YouTube, he became the darling of education reform advocates. But now that his Khan Academy is expanding into real classrooms, teachers are arguing over the value of the approach.